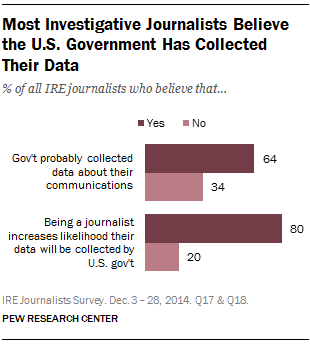 About two-thirds of IRE journalists (64%) believe that the U.S. government probably has collected data about their own phone calls, emails or online communications. This perception is especially prevalent among those who cover national security, foreign affairs or the federal government. Fully 71% of this group says the government has likely collected this data. Eight-in-ten of all journalists surveyed (80%) express the belief that being a journalist increases the likelihood that their data will be collected by the U.S. government. Despite a majority believing they may be electronically surveilled, particularly because of their work in journalism, open-end responses reflect wide-ranging views about the real possibility of the government collecting data about their communications. While some journalists clearly feel vulnerable or work under the assumption that all electronic communications can be monitored (“I figure everything I do is tracked”), others see this monitoring as such a remote possibility that it does not warrant much attention (“I don’t worry too much”). Many assert that only journalists focusing on national issues or government investigations would be monitored, and some feel the likelihood of being monitored in the U.S. is small compared with the likelihood of experiencing it in other countries. IRE journalists working for news organizations are evenly split on whether their employer is doing enough to protect them and their sources from things like surveillance and hacking. While 47% of these journalists say the organization they work for is doing enough to protect journalists and their sources, 50% say they are not doing enough. About one-in-five respondents who work for a news organization (21%) say their employer has taken steps or changed policies in the past year to protect journalists from electronic surveillance and hacking, while 36% say their employer has not done this. Another 42% are not sure if their employer has taken any steps or changed any policies in this area. Respondents’ verbatim responses indicate that while some organizations appear to be doing a lot, others appear to be taking few, if any, steps. In a world of diminishing newsroom resources, some respondents say the issue has not risen to a level where it can be treated as a budgetary priority. Comments also show that while some journalists view these issues as being the responsibility of the IT department and something they do not pay much attention to, others are actively encouraging their organizations to improve. Moreover, the vast majority of respondents (90%) believe their ISP would share their data with the U.S. government as part of standard National Security Agency (NSA) data gathering, and 97% believe their ISP would share their data if subpoenaed by the government as part of a criminal investigation.